Seat belt buckle ends assemblies with matched latch ends. Buckles include push button with sleeved and non sleeved webbing in multiple lengths plus end release push button with a cable or bracket end in various lengths. 8395B: 8" long with contoured sleeve. Sleeve is removable. 8399B: 12" long with contoured sleeve. Sleeve is removable. 8398B: 18" long. Non sleeved. Standard buckle has a globe design on the press area. 8184-6: 6" Long. Bracket length 3 3/4". 9/16" bolt hole. 8184-9: 9" Long. Bracket length ".1/2" bolt hole. 8184-12: 12" Long. Cable length 9 3/4". 1/2" bolt hole. 8184-18: 18" Long. Cable length ". 1/2" bolt hole. 8184-22: 22" Long. Cable length ".1/2" bolt hole. Includes matched adjustable chrome latch end. 8391-8: Measures approximately 8"L X 2 1/8"W. 1 7/8" wide recessed buckle opening. 8391-12 Series: Measures approximately 11 1/2"L X 2 1/8"W. 1 7/8" wide recessed buckle opening. Includes removeable mounting bolt hole cover. 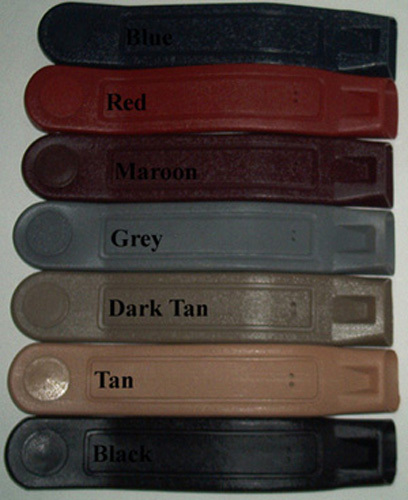 Color not guaranteed to match an existing seat belt or interior color. Not guaranteed to fit an existing seat belt buckle assembly.